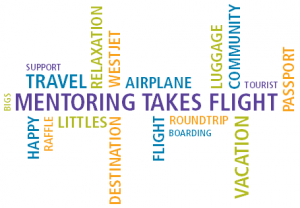 A Big Thank You to WestJet for supporting our “Mentoring Takes Flight Raffle.” Thanks to all who entered to win. Your support is a tremendous help for Winnipeg’s children & youth enrolled in our programs! Congratulations to Jerry B for winning the roundtrip flight for 2 with WestJet to any regularly scheduled destination AND supporting Big Brothers Big Sisters of Winnipeg’s youth mentoring programs! Every year Big Brothers Big Sisters serves over 650 Winnipeg children and youth. These programs help our Littles to feel more confident, have increased self-esteem and grow into community-focused individuals.